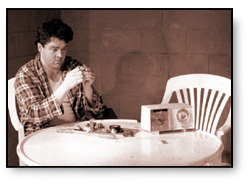 This play, that we tried running as a late-night theatre experiment in November '94, was by far one of the funniest plays we ever produced. All of 10 people came to see it. Not to be deterred, we brought it back in '95. I think we had 50 come on the second go round. This was either a sign that our audiences couldn't care less about James McClure, or else they couldn't care less about us. I wasn't prepared to handle the second possibility.